Navy style baptismal suits for spring or summer baptism. The set includes blue cotton trousers that are embellished with bracelets in red or blue, hanging from the outside in a very modern style, with a white shirt and a white or navy jacket in a navy style with a lanyard in the middle and beautiful details in its pockets. Combine both sets with beautiful fabric bowtie. 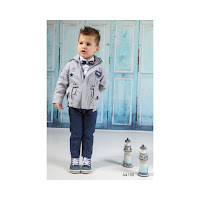 https://www.preciousandpretty.com/2018/07/navy-baptism-suits-for-boys-A4190.html Greek Wedding Favors|Orthodox Crowns|Stefana|Baptism Invitations Navy baptism suits for boys A4190 Navy style baptism suit for autumn or spring christening with jacket. Product #: Greek Wedding Favors|Orthodox Crowns|Stefana|Baptism Invitations_976115372768317844 5 stars out of 5 reviews.